The Basel Protocol on Liability and Compensation was adopted at the Fifth Conference of Parties (COP-5) on10 December 1999. The Protocol talks began in 1993 in response to the concerns of developing countries about their lack of funds and technologies for coping with illegal dumping or accidental spills. 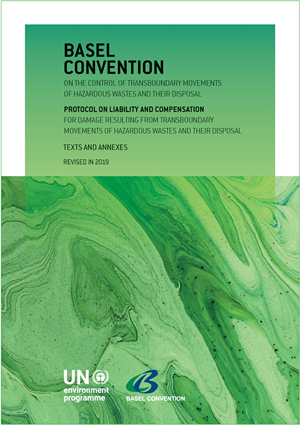 The objective of the Protocol is to provide for a comprehensive regime for liability as well as adequate and prompt compensation for damage resulting from the transboundary movement of hazardous wastes and other wastes, including incidents occurring because of illegal traffic in those wastes. The Protocol addresses who is financially responsible in the event of an incident. Each phase of a transboundary movement, from the point at which the wastes are loaded on the means of transport to their export, international transit, import, and final disposal, is considered. The Protocol shall enter into force on the ninetieth day after the date of deposit of the twentieth instrument of ratification, acceptance, formal confirmation, approval or accession. Please click here for the status of ratifications of the Basel Protocol on Liability and Compensation. The Conference of the Parties at its ninth meeting, appeals to the Parties to the Convention to expedite the process of ratifying the Protocol in order to facilitate its entry into force at the earliest opportunity.